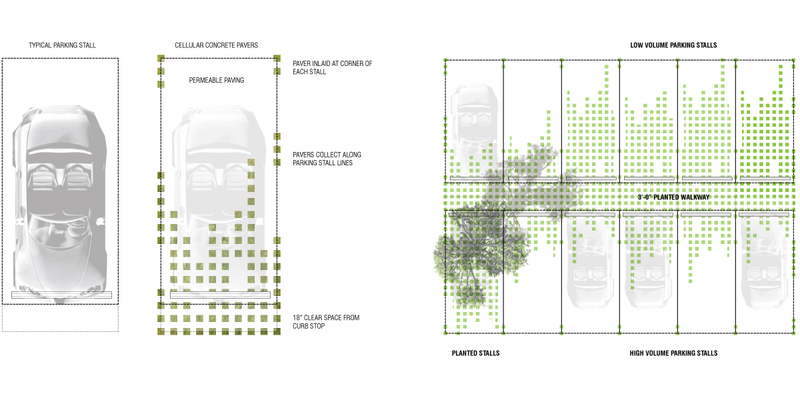 Parking Park is a model partnership and reuse for low-density retail parking lots in cities with lagging stormwater infrastructure. 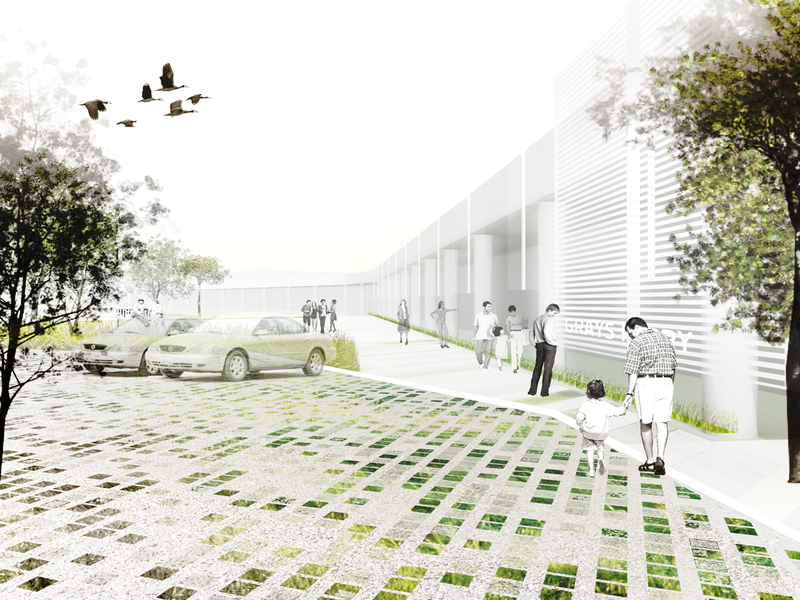 AGENCY partners Ersela Kripa and Stephen Mueller, in partnership with an interdiscipinary team of design professionals were selected as finalists in Infill Philadelphia‘s nationwide design competition, in which designs serve as a prototype for green stormwater infrastructure throughout Philadelphia and the US, illustrate potential public/private partnerships, and aid property owners in seeing the return on investment. 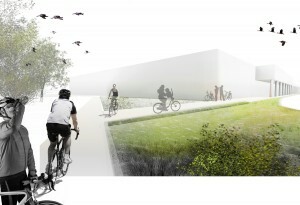 The project proposes a reconception of the site, from a one-sided, unwelcoming building frontage facing an under-utilized parking lot and street into a two sided approach: creating an active urban front-yard, and developing an approach to the river and river trail as a ecological back-yard. 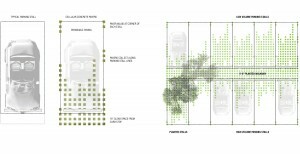 The design recognizes the unique potential of the site as a major node in a developing urban-scale transportation network. 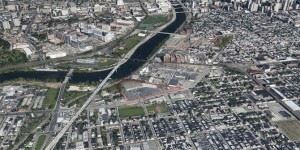 By increasing the visibility and safety of emerging circulation patterns, and sponsoring a bicycle and pedestrian access to the Schuylkill River, the project fosters and celebrates the sites’ new identity as a center for neighborhood activity, a waypoint for urban circulation, and a model for ecological performance – substantially improving stormwater management on site while providing benefits to on-site businesses, local residents and urban ecologies beyond its borders. 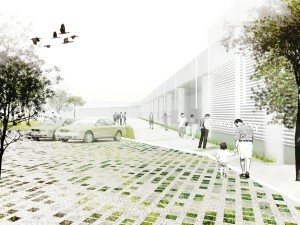 Conceived as a ‘learning landscape’, the distinctive environment educates customers to the benefits and beauty of integrated stormwater management systems while acting as a model for branded intervention – benefitting ‘anchor’ retailers with instantly recognizable, universally adaptable and ecologically innovative additions to their retail environments. 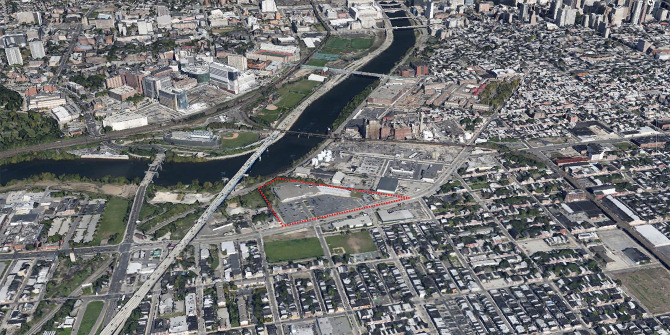 Pedestrian and bicycle use through the site is encouraged with continuous ‘bands’ of pathways, uninterrupted by vehicle traffic, while planted ‘swales’ slow water infiltration and connecting the retail center to surrounding development. By articulating the site primarily at its edges with multi-functional landscape elements the labor-intensive aspects of the project are reduced to a few clear lines of planting and cutting, also reducing conflict with existing infrastructure.